I have noticed that the word “itchy” comes up a lot when I talk about my synagogue anxiety. I think it goes back to the excitement of buying a new “temple” outfit every year. I’m a 1980s kid, and in my mind I’m still sitting in a pew, dressed up in a brandnew Benetton sweater dress, purchased for a crisp fall morning that was still many, many weeks away. I’m an adult now, so no one can make me wear a sweater before the first morning frost. There’s no reason I can’t go as far away as possible for the yomtoyvim. In 2016, for instance, I spent Kol Nidre in a London pub with one set of lefty Jewish friends and “broke the fast” at a North London Chinese buffet with a couple of the Jewdas folks (no, Jeremy Corbyn wasn’t there). In between these celebrations, I communed with the mummies at the British Museum and reveled in my extreme lack of angst. But did I really have to travel of thousands of miles away from friends and loved ones to escape my problem with Jewish worship? In 2018 my feelings around Yom Kippur got notably angrier. I may have raised a few eyebrows when I tweeted before Kol Nidre that I would not be humbling myself before a god who would allow a childabusing monster into the most powerful office in the world. Hashem? F that dude, I tweeted, with my usual subtlety. I didn’t bother to move my therapy appointment so it wouldn’t overlap with pretending to care about synagogue. As I walked down the street in clothes far from itchy, I felt defiant: let the entire Upper West Side know I wouldn’t be groveling before any judge, Heavenly, District Court or Supreme. And yet, I still missed something. Starting in the late 1880s, radical Jews started organizing Yom Kippur balls, epic parties meant to demonstrate the participants’ emancipation from what they saw as old fashioned and stultifying tradition. As Eddy Portnoy notes, what was essential to those balls was first, that they were communal affairs and second, those participating had something to rebel against. So where does that leave the solo abstainer a hundred years later? ROKHL KAFFRISSEN, “Caught Between Skepticism and Yearning on the Holidays,” The Lilith Blog, October 10, 2018. The world never made any sense to Amanda Stern–how could she trust time to keep flowing, the sun to rise, gravity to hold her feet to the ground, or even her own body to work the way it was supposed to? 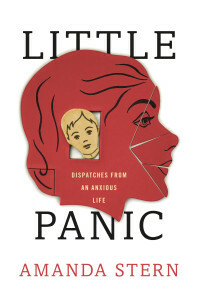 In her memoir Little Panic: Dispatches from an Anxious Life, Amanda describes this feeling. Deep down, she knows that there’s something horribly wrong with her, some defect that her siblings and friends don’t have to cope with. Growing up in the 1970s and 80s in New York, Amanda experiences the magic and madness of life through the filter of unrelenting panic. Plagued with fear that her friends and family will be taken from her if she’s not watching—that her mother will die, or forget she has children and just move away—Amanda treats every parting as her last. Shuttled between a barefoot bohemian life with her mother in Greenwich Village, and a sanitized, stricter world of affluence uptown with her father, Amanda has little she can depend on. And when Etan Patz, the six-year-old boy down the block from their MacDougal Street home disappears on the first day he walks to school alone, she can’t help but believe that all her worst fears are about to come true.